More than 20,000 people lined the banks of the Tyne for a show marking start of the Great Exhibition of the North. Up to three million people are expected to visit the 80-day festival, which celebrates the scientific and artistic achievements of the north of England. The festival, centred on the Newcastle and Gateshead quaysides, is predicted to generate about £184m. It opened at 13:00 BST, with a further ceremony at 22:00 BST featuring aerial displays of drones and live music. Former Chancellor George Osborne came up with the idea as part of his Northern Powerhouse scheme. Nick Forbes, leader of Newcastle City Council, said: "The Great Exhibition is an opportunity for us to say, loud and proud, that our better days are ahead of us, rather than behind us." 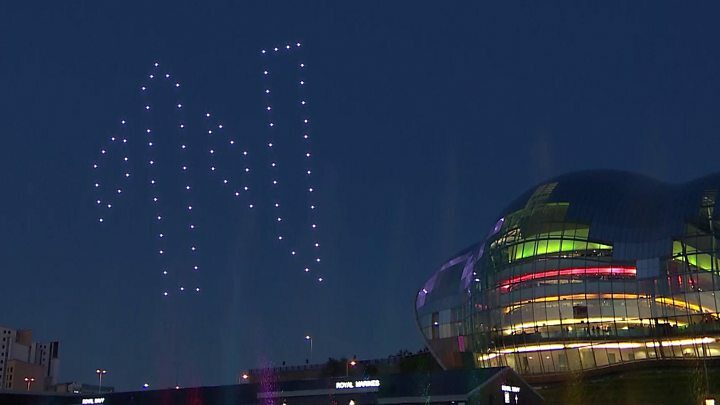 A hundred drones fitted with LED lights were piloted in formation between the Sage music centre and the Baltic art gallery, choreographed to form different 3D shapes. Projects director Mungo Denison said: "We don't think people have seen something like this before." There was also an 80m water sculpture on the Tyne and a spectacular fireworks display. The opening night line-up included Maximo Park, Turner Prize-winning artist Lubaina Himid and Stephenson's Rocket. Among the other highlights are John Lennon's last piano and the original Postman Pat models. The exhibition will continue until September, with events and trails at 40 venues across Tyneside. Newcastle Gateshead Initiative chief executive Sarah Stewart said: "It will reward repeat visits, there's no way someone coming for the day would be able to see all aspects of it." Matt Hancock, Secretary of State for Digital, Culture, Media and Sport, said: "Newcastle-Gateshead will put on a fantastic festival for the whole country. "It will once more highlight the creative strength of the Northern Powerhouse and how cultural investment can boost economies and inspire communities." Carol Bell, executive director of Great Exhibition Of The North, added: "This marks the start of an incredible summer and we hope local residents and visitors from far and wide will come and experience the array of amazing exhibits, live performances and displays of innovation we have on offer for free throughout the summer." An "alternative" event, The Other Exhibition of the North, has also been set up, which organisers say is aimed at being "broader and more diverse".